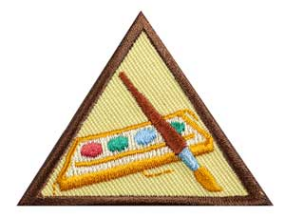 brownie painting badge | Plant, Plant, Electro...What? Our fourth meeting of the year was also our first field trip. We went to Canvas Crashers, a local social painting studio, so the girls could complete the first two steps of the Painting Badge. The owner of the studio talked about his art – what he does, why he makes art, and why he likes to teach others how to make art. The girls painted a tree in autumn for their still life. I’m sure that this was bending the rules a bit as they didn’t painted from a picture of a tree instead of an actual tree, but they had fun with it. I liked seeing how different their paintings were even though they all painted the same thing. Fresh back from our trip to Virginia, my troop had a field trip to the Castellani Art Museum. We signed up for their weekly Art Express program ahead of time, the instructor knowing we had Brownies wanting to earn their Painting Badge. Van Gogh was the theme, so all activities were centered around his Sunflowers painting. The instructor started off the program by giving the girls a tour of the art museum, then read a picture book to set the theme – Camille and the Sunflowers by Laurence Anholt. 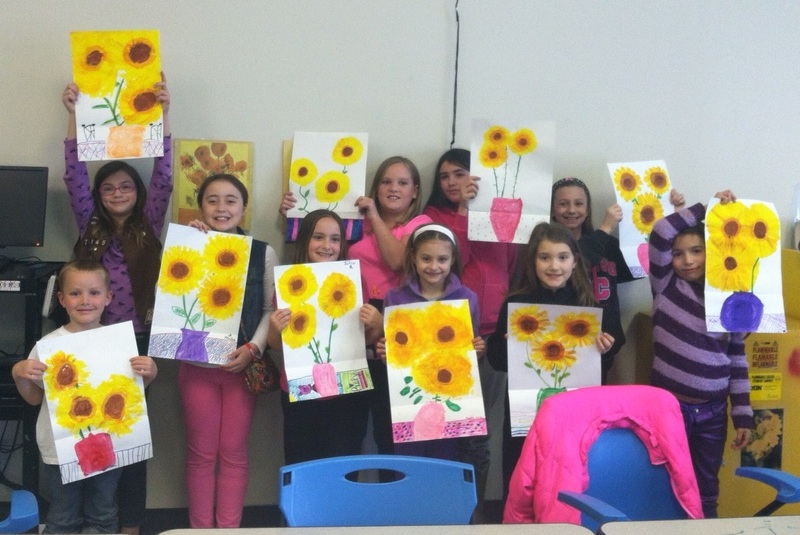 The girls spent the rest of the program painting their own version of Sunflowers using several different techniques and mediums. Paint for the flowers, white crayons to create a resist for the vase, and markers to add stems/leaves and the background.